THIS EVENT IS SOLD OUT "@35TH and R" is a series of events designed to engage community around topics related to art and culture. The first in the series welcomes Emmy Award Winner, comedian/activist/actor and Ellington alum, Dave Chappelle. Join us as we celebrate Dave and the Ellington legacy he embodies. Your contribution includes, not only a ticket to see Dave perform at The Warner Theatre, but also the opportunity to hang out with him at the new modernized Ellington, the place he calls home. The Duke Ellington School of the Arts was established in 1974 and remains the sole D.C. public high school to offer a dual curriculum encompassing professional arts training and academic enrichment, in preparation for college and careers in the arts. Ellington nurtures and inspires passion for arts and learning in talented students who might not otherwise have an opportunity to develop their artistic skills. This series benefits the arts programs at the school. 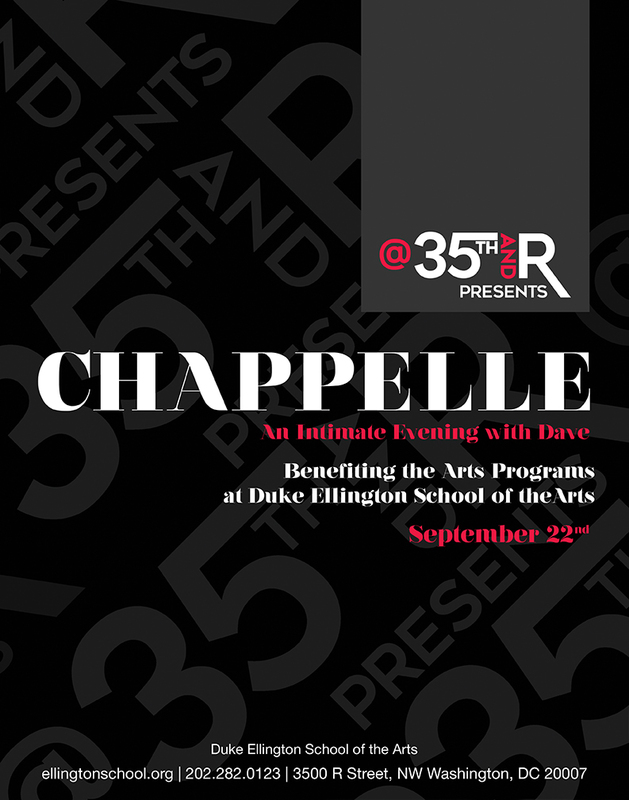 Your donation grants you entry to Dave Chappelle Live Show at The Warner Theatre AND the special reception with Dave being held at Duke Ellington School of the Arts on Friday, September 22nd, 5-7pm. Pick up tickets for show at Ellington table at the Warner Theatre. Choose donation amount that coincides with number of tickets requested - $1,000 per ticket. Amounts above $99.99 will be considered a charitable contribution. MUST PRESENT CONFIRMATION EMAIL FOR ADMITTANCE TO SHOW and FRIDAY RECEPTION.